This Wedding Photography for Brooklyn Winery shows off one the most coveted Brooklyn wedding venues. A wedding at this venue is a beautiful experience for all who attend, and Wedding Photography for Brooklyn Winery displays the venue’s elegant yet rustic atmosphere. 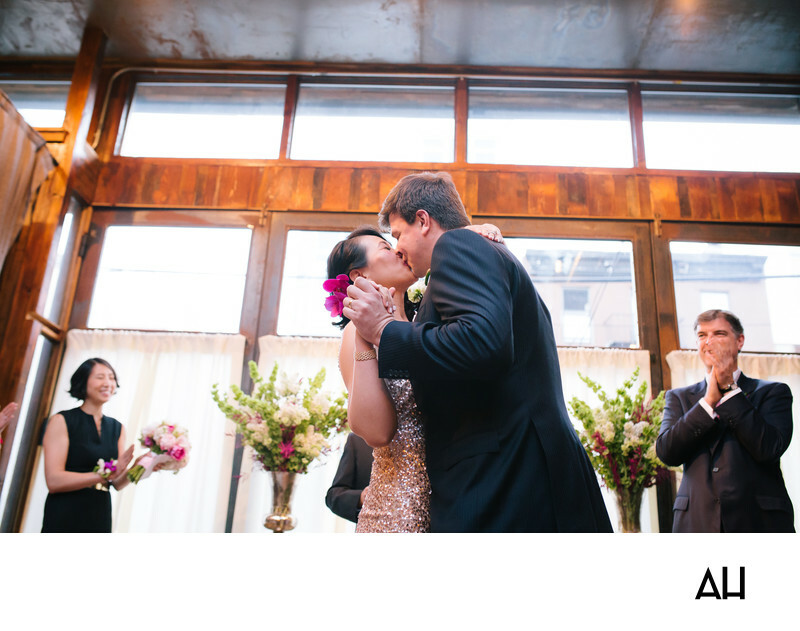 This photograph of the bride and groom at their wedding ceremony was taken in the winery’s Atrium space. The Atrium is the crown jewel of the venue, and a perfect space for a wedding ceremony or an intimate reception. This location within the Brooklyn Winery is an airy space that boasts a gorgeous glass roof. The roof is the highlight of the room, allowing guests to feel the rays of the sun overhead or to see the stars shining up in the night sky. The Atrium is surrounded by floor windows and a hanging succulent wall garden. It is a space that takes couples and their guests out of the city and places them in a setting that has a natural, rustic feel as well as a chic, modern appearance. The couple pictured share their first kiss as husband and wife with the early afternoon sun warming the window panes behind them. The light that comes in from the ceiling of the Atrium illuminates their happy figures, and adds to the sparkle of the bride’s unique wedding gown. Around the bride and groom, family and friends clap and cheer, joining in the celebration of love that is occurring before them. The day’s festivities have only just begun, and so has this new chapter in the couple’s relationship.